Following a two year redevelopment, The Pier Arts Centre re-opened in July 2007 to widespread acclaim. The original listed buildings and pier have been sympathetically extended by Reiach & Hall Architects who have created a stunning new building at the harbours’ edge. The following 18th – 20th Century history is provided by local historian Bryce Wilson. The buildings are firmly rooted in the history of Orkney. The house fronting the street was built in the 18th century, and during much of the 19th century was occupied by Edward Clouston, a prosperous merchant and Agent of the Hudson's Bay Company. On the pier behind the house Clouston erected stores and offices. The arrival early each summer of the Hudson's Bay Company ships en route for Canada was a social highlight in Stromness. In June 1840 the Cloustons entertained a party of ladies travelling to join their husbands in the Hudson's Bay Company. Their house had a finely panelled first-floor drawing room, furnished with books, family portraits and a pianoforte. Their daughter, Anne Rose later married Augustus Edward Pelly of Montreal, a relative of John Henry Pelly, governor of the Hudson's Bay Company from 1822–52, and of the Bank of England in 1841-42. 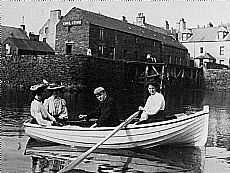 In the late 19th century Stromness was a flourishing centre for herring fishing, with hundreds of boats jostling for position in the harbour. One of the town’s leading merchants, John Aim Shearer, acquired the premises in 1872, to house his business, which lasted nearly 100 years. He erected a shop across the street from his house, and on the pier established a cooperage. At this time most trade with the east coast of Scotland was carried on by local trading vessels and Shearer's schooners, Maggie, Janet, Mary Ann and Minnie, three of them named after his daughters, were a familiar sight discharging their cargoes at the end of the pier. The herring boom passed and by 1918 all Shearer's schooners were gone - three of them lost at sea. The pier became a quiet backwater and so it remained until the Second World War, when the upper part of the pier store was requisitioned by the Royal Engineers as a base for planning the many army camps and installations required in the area. Later the upper floor was used as a dwelling and between 1965 and 1971 the property was split between three owners. The main dwelling and part of the pier building became a private lodging house and hostel. 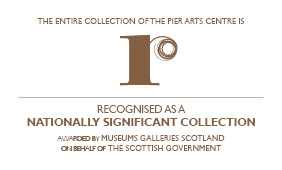 In 1977 The Pier Arts Centre Trust purchased the original dwelling and the pier store to house The Collection generously donated by Margaret Gardiner. A major re-development of the buildings was completed in 2007, providing full access to the centre’s facilities and the environmental plant and equipment needed to care for the Centre’s valuable Collection into the future. Space for displaying art has more than doubled, an income-generating gallery shop has been established and new office accommodation has allowed a much needed increase in staff numbers. The building conversion has maintained the historic charm of the original Pier Arts Centre and the exciting new spaces for art and creative activity allow the Centre to develop its potential. The outstanding quality of Reiach & Hall's scheme was recognised through the award of the Royal Incorporation of Architects Scotland’s Andrew Doolan Award for the Best building in Scotland 2007.